The market requires highest flexibility from electronics manufacturers. Placement speed not only influences production cost but also the networking, integration, simulation capabilities and machine capacities. 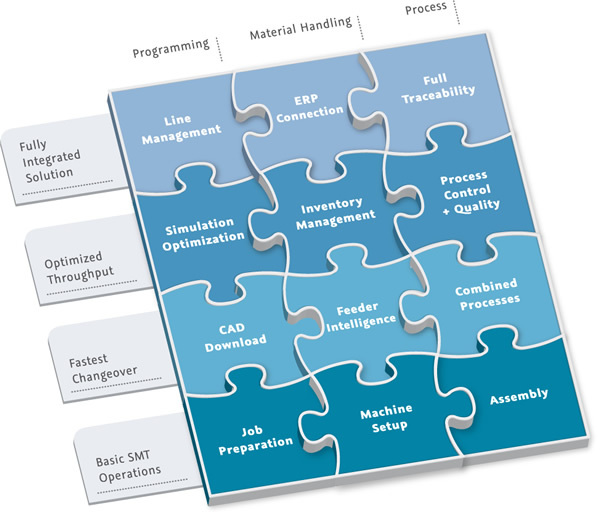 SMART Solution from Essemtec is the world’s first modular system that enables complete optimization of SMT production. By Adrian Kühnis, Azular GmbH, Switzerland. SMART Solution from Essemtec is a holistic, modular and flexible system of matching and interacting hardware and software tools for SMT production. SMART Solution provides the fundamental functions required for managing flexible production, supporting growth and adapting quickly to changing requirements (Fig. 1). The modern SMT production is confronted with many different challenges. Margins, delivery times and batch sizes are shrinking, while product variety increases. Most manufacturers also experience a growing demand for production traceability, humidity control and real-time-tracking of the component stock. The higher placement speed alone is no guarantee for efficiency or economy of SMT assembly. Many other factors are influencing the overall throughput and production cost at least as much. Therefore, new methods are required in electronics manufacturing because the assembly process is only one part of the global system of hardware and software components, which can all contribute to improve the OEE (Overall Equipment Efficiency). This is where SMART Solution makes the difference. The system provides the necessary tools and functions for the manufacturer to get more from his current investment, to reduce cost further and to sustainably increase quality. Simplifying the operation of complex machines is the key to reducing human errors. A graphical, touchscreen-based interface, such as the eeZ technology from Essemtec, is a modern and effective solution. It simplifies correct entries and allows intuitive zooming, moving and selection. The SMART Solution user interface is multilingual and includes online training lessons. The logical structure and context sensitive help system also make it easy to learn (Fig. 2). Operators find the same interface and structure on all machines, from pick and place to dispensers and offline programming stations. This ensures high employee motivation due to SMART’s systematic operation and ease of use. Furthermore, training and education costs are minimized. Implementing a machine into a network has many advantages, such as enabling the use of online and remote support tools. Therefore, professional support is available just in time. Production preparation can be carried out offline without interrupting the current job. Production files can also be dispatched easily to different production lines or even different production sites. Flexibility is of highest importance. Therefore, an intelligent feeder system for pick and place machines is imperative, as well as feeders that can be exchanged during production (hot-swap feeders). These feeders can move the production start forward because the machine preparation can be achieved in parallel to the current production. The introduction of barcode identification has simplified and improved the speed of feeder setup (Fig. 3). A feeder is programmed simply by scanning two bar codes, one on the feeder and one on the component reel. After that, the intelligent feeder can be mounted on any machine. The active feeder bus will automatically know about the feeder type, component type, remaining stock and pickup positions. Programming time can be reduced further by importing CAD data directly. The universal SMART CAD converter creates complete pick and place and dispensing programs directly from the board's CAD data. The realistic visualization also allows control and correction of the program prior to the placement of the first component. 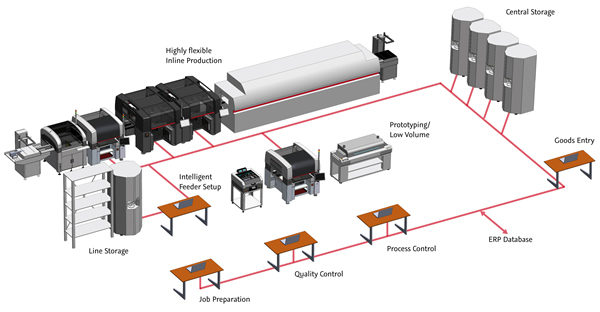 The SMART Solution concept significantly reduces investment cost for SMT production. One of the reasons is that less machines are required. 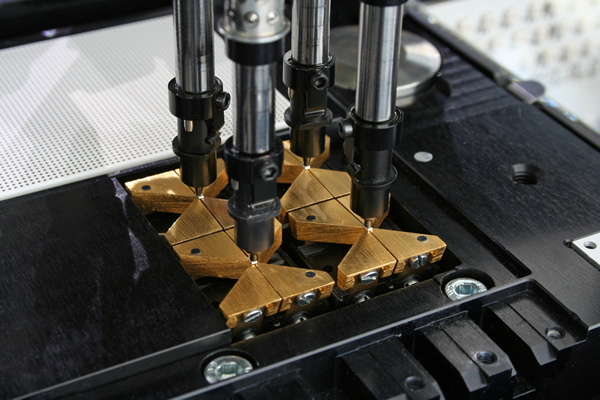 A pick and place machine from Essemtec can place all component types, from 01005 to large IC and connectors. In addition, the machine can be equipped with dispensing valves. Only a single machine is required for all processes, instead of a set of chip shooters, dispensing equipment and a fine pitch placer. Any kind of dispensing valve can be installed such as jet, screw and time-pressure. The fast piezo jet valve provides glue dispensing at up to 120,000 dots per hour. The paste dispensing valve can save the cost of expensive step stencils as it can add solder paste inline. 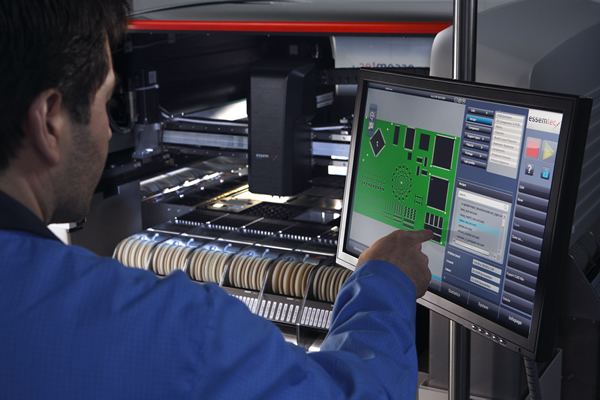 Based on the integrated fluid database, the programs for glue and paste dispensing are automatically created from the pick and place data. Another great cost saving potential lies in the feeders. Width adjustable SMART feeders are very popular as they can handle different tapes. They increase flexibility and reduce cost as they do not require expensive feeder lanes and minimize the total quantity of feeders in production. SMART feeders can be exchanged during production, which makes expensive feeder trolleys unnecessary. Even the most flexible machine is inefficient if job planning is chaotic or if components are missing. Intelligent planning for jobs and feeder setup, as well as exact control about component stock, offers great potential for throughput increase. SMART Solution uses special algorithms to simulate and optimize multiple jobs in advance. Optimal feeder positions and the number of feeder changes can be weighed against each other to define the best strategy. By simulating and optimizing the production, machines can run without interruption. The combination of intelligent feeders, machinery and inventory management allows the complete control of components, stock and expiration dates. Operators can prepare outgoing components in time or can set up special components before they are needed (Fig. 4). Moisture sensitive components may only stay for a short time without protection. This so-called open time is defined in the IPC/JEDEC J-STD-20 standard. The documentation of the open time is crucial for many medical and aviation applications. The SMART Solution software automatically stores the required data and calculates the remaining floor lifetime. In addition, a Tower storage system from Essemtec can provide a controlled, dry atmosphere where sensitive components are stored without protecting packing. Its FiFo-principle (first-in, first-out) guarantees that the oldest components are used up first. The error rate of a production process depends on many factors and the SMART Solutions minimize most of them. Human errors are avoided by providing an easy-to-use operation interface by setting access levels and providing context sensitive help. 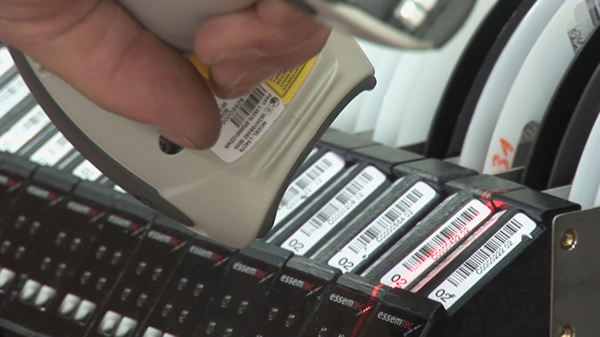 Using barcodes for feeder and component identification avoids feeder setup errors. Pickup and placement positions are continuously surveyed and corrected. Cameras offer a 100% monitoring of components from pickup to placement. Printers are equipped with 2D inspection and dispensing machines integrate closed-loop control of the dot size. A Component Verification Unit measures the value and the polarity of resistors, capacitors, diodes and transistors before placement (Fig. 5). By means of the CVU the tolerance of each individual component can be verified with highest precision or a sample can be inspected after a reel change. These are only a few of the features and tools that are available from the SMART Solution to ensure a controlled, stable and reliable production process. SMART Solution communicates in real-time with machines and can re-optimize the production automatically. It balances modules in a line or distributes jobs to different production lines. However, SMART Solution is not alone in the production universe but is in contact with parent planning systems too. Most machine manufacturers depend on expensive interface solutions from 3rd party suppliers but not SMART Solution, which automatically prepares the data for external ERP systems. A standardized interface allows data exchange with all modern ERP systems. As priorities and production plans can change fast, it is important to keep component stock up to date, guarantee quick access to material and save production data for analysis and optimization. Before SMART Solution was available, increasing efficiency was only possible by investing more in faster machines or reducing the flexibility by concentrating on a few dedicated tasks. The integrated SMART Solution from Essemtec completely changes this. With SMART Solution, the manufacturer maintains flexibility but can deliver faster and reduce the production cost. Additionally, the system is modular and can be upgraded at any time, from a single machine, up to an integrated manufacturing floor with multiple machines. The original investment is always protected. Essemtec Launches Essemtec France Sarl.